The latest report from the U.S. Energy Information on the Utica Shale (combined Ohio, Pennsylvania, and West Virginia production) continues to show a dramatic rise in natural gas production from the Utica. And the Marcellus Shale is in a class of its own, with production nearly equal to the next four combined. 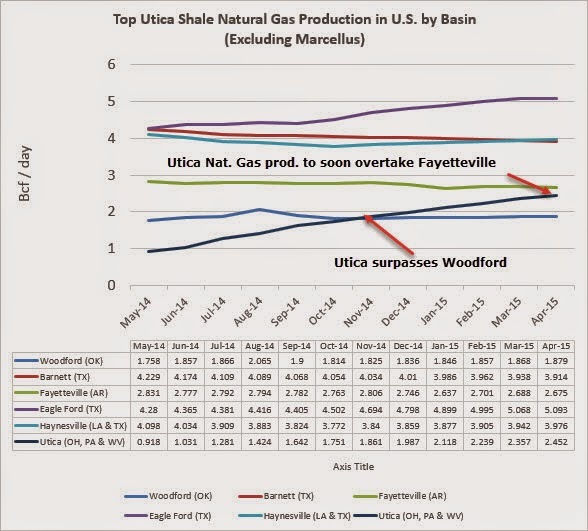 The diagram below, excluding the Marcellus in order to show relative scale amongst the other top natural gas producers by rank, illustrates the steep natural gas production increase from the Utica. Data from eia.gov, retrieved May 14, 2015. The Utica Shale is ranked 6th in monthly natural gas production, having taken the number 6 spot from the Woodford in November 2014. And while most of the shale natural gas plays showed steady or slightly declining year over year production, only the Eagle Ford, Utica, and Marcellus shales showed a relatively steep increase. And with the near leveling of the Fayetteville the Utica should pass the Fayetteville in total monthly production in June of this year. After that, the Haynesville should be the next to be overtaken the Utica Shale in monthly natural gas production, likely by the end of 2015 or early 2016. Utica second in production increase, first in percentage increase. The Utica Shale experienced the second overall largest production growth with 2.45 Bcf per day in April 2015, up 1.59 Bcf/day from April 2014. The increase was surpassed only by the Marcellus with showed a whopping 15.24 Bcf per day in April 2015 vs. 12.51 Bcf per day in April 2014, up 2.74 Bcf/day. Though the Utica Shale more than doubled in natural gas production over the last year, and just shy of tripling, holding the distinction of largest (by far) percentage increase.